Just for the thrill seekers! 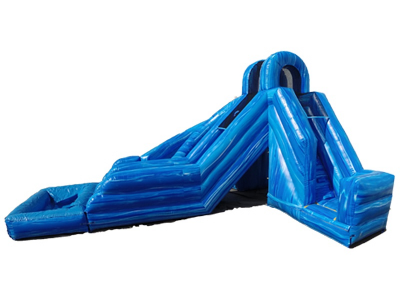 Check out our New 22-Foot High Massive Dual Lane Blue Marble Dry Slide! 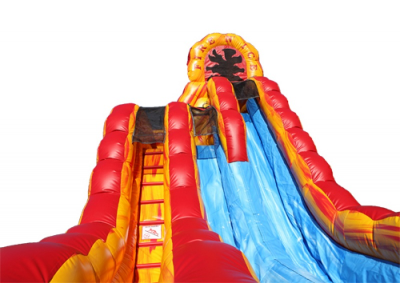 Amaze your friends and family at your next event by sliding down this 22-foot drop slide! Perfect for kids with lots of energy! 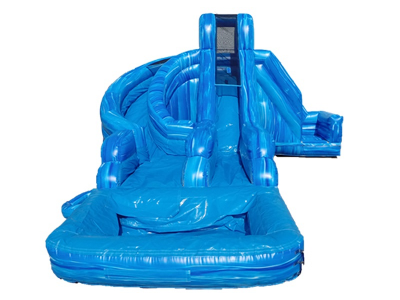 Check out this unique dual lane Helix Water Slide with wavy blue colors. 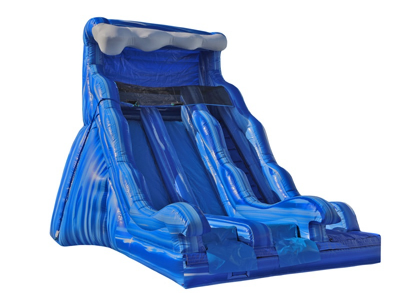 This awesome dual lane slide features a climber, 2 slides, one with a straight slide and one with a curved slide, both leading into a big pool of water for a splashing good time. Great for cooling off during those hot Summer days. 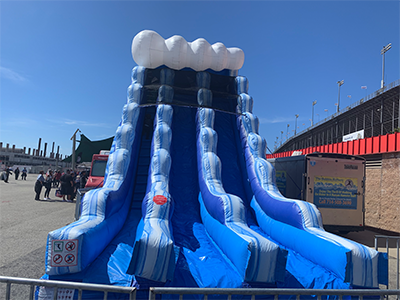 The Helix Water Slide is great for children and adults! Need a 3′ pathway to the setup location. Please advise colors are not as shown in image, colors are plain blue and white. 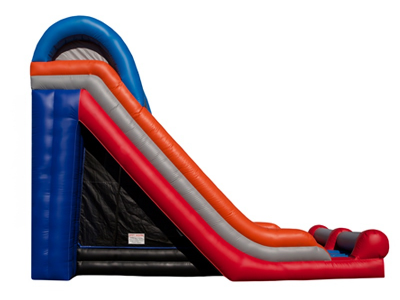 This 2-story Dual Lane Slide is a sure success at your party or event. 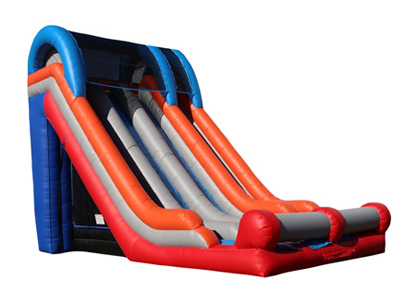 It is a perfect addition for bigger events and can cater to a wider audience since it has 2 levels to slide down. 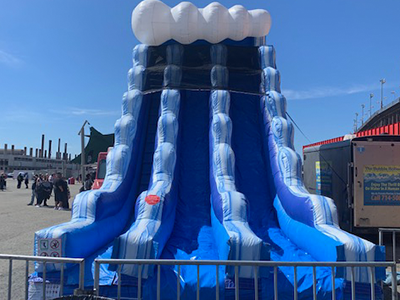 You can have smaller kids sliding down the short platform, or if you have older kids and they want to feel more of a thrill, they can climb to the top and slide away. 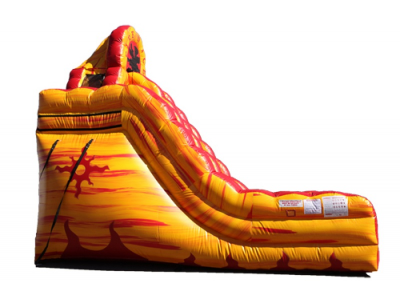 Comes in the beautiful color tones of a fire, don’t just be mesmerized with this slide, rent it for your next party or event. This is one of the most unique slides you have ever seen. 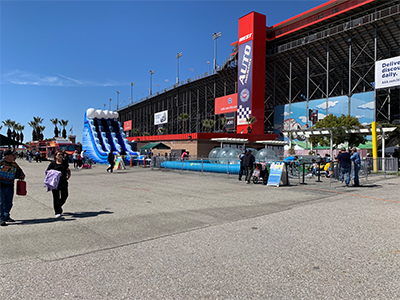 Lots of thrills and laughs can be found here! 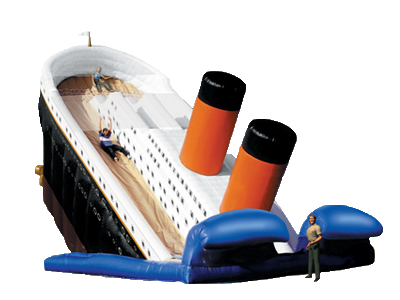 The Titanic Slide is truly an experience you will never forget. Neither will your guests! 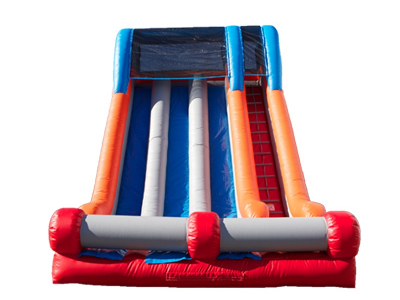 This 25′ tall slide is a dual lane slide that is good for ages 12 to adults. 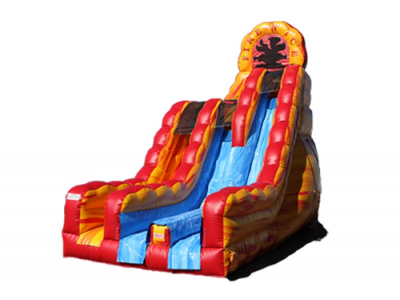 Feel the thrill and rush as you slide down and while you escape the sinking Titanic. 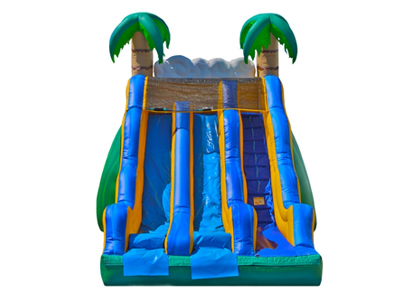 Surf down the 17′ tall Tropical Dual Lane Slide and cool off this Summer while you have a great time. 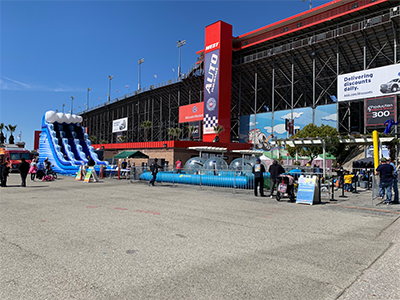 Rent the Tropical themed Dual Lane Slide for your next tropical or Hawaiian party and race with your guests in this 2 lane exciting slide. 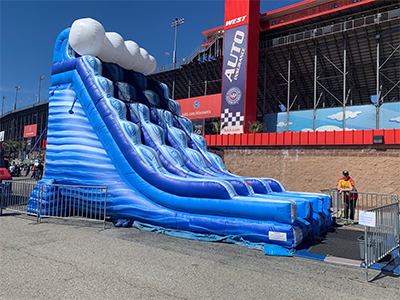 Riders climb up to the top, pick from one of the 2 lanes, slide down to the bottom and are stopped by two bumps at the bottom. Great for ages 5 and up to adults. 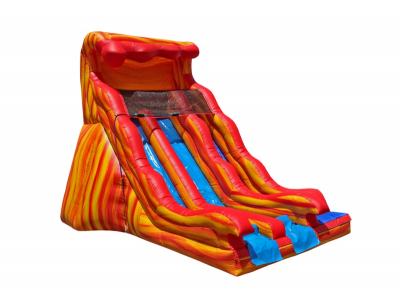 Surf down the 17′ tall Wave Dual Lane Slide and cool off this Summer while you have a great time. 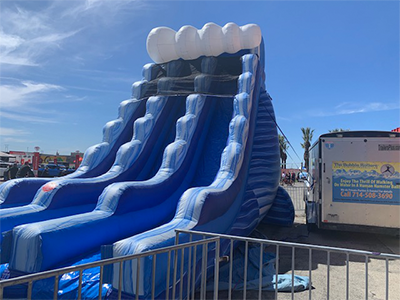 Rent the Wave themed Dual Lane Slide for your next tropical or Hawaiian party and race with your guests in this 2 lane exciting slide. 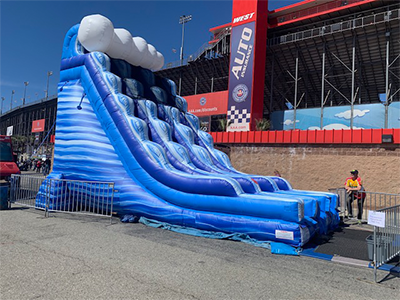 Riders climb up to the top, pick from one of the 2 lanes, slide down to the bottom and are stopped by two bumps at the bottom. Great for ages 5 and up to adults. 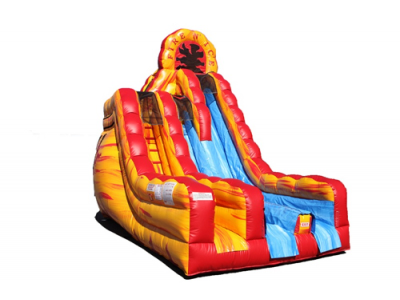 Surf down the giant 20′ tall Fire Dual Lane Slide and cool off this Summer while you have a thrilling time. 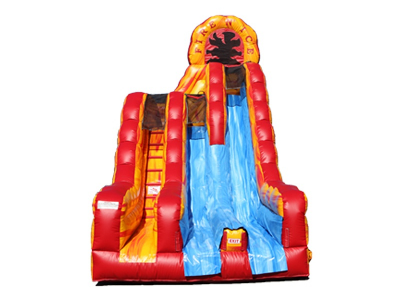 Rent the 20′ Fire Dual Lane Slide for your next party or event and race with your guests in this 2 lane exciting slide. 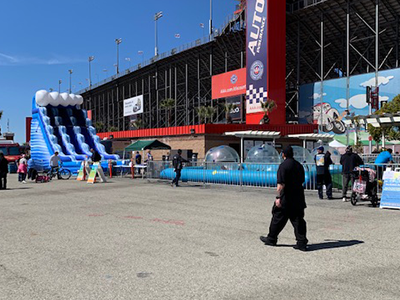 Riders climb up to the top, pick from one of the 2 lanes, slide down to the bottom where they are stopped by a bump. Great for ages 5 and up to adults.